'Not your ordinary rental' It's a real home, with cozy, artful touches and fabulous views. Enjoy the fireplace while kids play in the snow right outside the door. OUR SUN-FILLED, 2-story home is fresh and clean... comfortably furnished, with antiques, art and charm. Located on Basque Drive, one of the most beautiful streets in Northstar, which backs up to the valley and Golf Course. CONVENIENT: 1 minute drive children's Minor's Camp and day care; 5 minute drive to the Village/tennis/rec room. -Master suite has queen bed and Ralph Lauren/Company Store 100% cotton linens. Lounge in bed and enjoy the expansive view. -2nd guest room has queen size bed, and view. -Third bedroom has two single beds with plenty of room for air mattress. -The guest bathroom has a double sink, and separate 'room' w/ toilet. Lots of privacy and room to get ready to hit the slopes. PLUS: all the owner's benefits at Northstar Rec Center: 10 tennis courts, two swimming pools, huge Jacuzzis, rec room, etc. etc. Teens hang in the game room. For a change of pace, pick up the binoculars and grab a chair on the back deck. With Martis Valley as your own private back yard, there are lots of birds and other creatures to spot. Ready for an excursion? 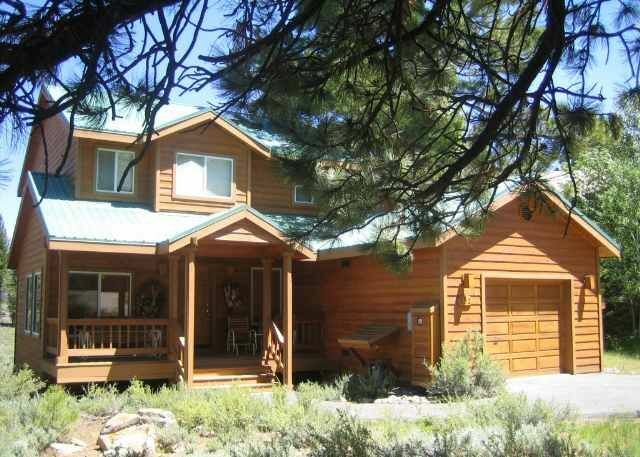 It's a quick 15 minute drive to Truckee for shopping and dining, or 15 minutes to Lake Tahoe. In the house you will find a binder of all the interesting shops, restaurants, hiking trails, and interesting activities to do. FREE door to door shuttle bus to village and rec center. See link below for more pix. We fell in love with the view! and the ability to play right outside the back door: build snowmen, hike or cross country ski. You feel like you have acres of preserved park land that's all yours. Only a few steps up to the house. No long staircase to climb... especially in ski boots! Incredible, unobstructed views of meadow and mountains beyond. Small Indian "reservation" in cluster of fir trees behind the house. toilet, combination tub/shower, Double sink, and toilet in a separated closed door area. Northstar at Tahoe! Use of Member recreation center, including tennis courts, spa, pools, etc. Local calls. Wireless connections Skype. River stone wood burning fireplace. Top quality pots and pans. Fully equipped. Help yourself to spices, tea, condiments. Flat screen TV w/Cable and DVR box to download movies. Only a few steps into the house. And flat driveway. Great for carrying ski gear. This house is well maintained and clean, with a convenient location served by the complimentary shuttle to Northstar. The three bedrooms (one with en-suite bath) and hall bath are all located off a small central landing upstairs so good for groups of people who want to be near each other. Downstairs, the eat-in kitchen has some separation via partial walls and the dining and great room areas are a single open space with high ceilings and large windows with views of the meadow which is just outside the sliding patio doors. From the kitchen sink you can see outside to the patio which is convenient if you have kids playing outside. The garage was large enough to fit a single car (as long as you don’t have a roof box or a very large car). Andy was a very responsive and thoughtful host. The bathrooms and kitchen don’t appear to have been renovated while some other places we have rented were built more recently (such as in Northstar Village) or have been remodeled, but everything functions well and is clean and kept in good repair, so that was not an issue for us in a vacation rental. We would definitely consider staying here again. Thanks for a nice week! The house was comfy and nicely decorated and conveniently stocked with everything we needed for a cozy weekend. From books to boardgames, a full kitchen with coffee and condiments, an easy to start fireplace and plenty of firewood, and super comfy furniture throughout, the house fit our needs perfectly. Though we had access to the free shuttle, the house was close enough to Northstar that we could drop off the skiers and boarders in our group at the Village in under 10 mins (the roads were well plowed and easy to drive). The shuttle, since it was busy, took much longer than that. The snow covered backyard overlooked a forest and it was a winter wonderland, perfect for building forts and taking advantage of the sleds, shovels, and snowshoes they had in the garage for us to borrow. Having space to park in the garage and the long driveway was very convenient as well. The homeowner was accessible and very helpful throughout the stay. I couldn't say enough good things about how much she cared about our stay and whether we had everything we needed (we did). So thoughtful. I would definitely recommend this house and would book it again. I wish we could have stayed another week at least with all the amazing snowfall recently. Thank you Sunny for the lovely and detailed review of our home. We are so glad you enjoyed your stay! Please come again. Expansive views of the Valley from many rooms. The house is really well stocked, easy to get to the mountain, and a great lay out. Great house, really nice owner with great attention to detail to make your stay easy! So pleased you enjoyed your stay! The owner responded quickly to our request and offered lots of helpful information to make our week easy and care-free. My husband and two college-aged sons spent a week of late summer enjoying amazing hikes right out the front door and venturing to nearby Truckee and Lake Tahoe. The kitchen is well equipped, the outside area is just the right spot for al-fresco dining, settling in with a good book any time of day (soaking up sun) or enjoying some morning cool with a cup of coffee or tea. The wifi helped those of us who needed to be connected stay connected to the outside world, and the rest of us enjoyed good community space to spend time together and plenty of private space to have moments alone when that was needed too. It was a lovely stay. Minus one star only because it was a bit inconvenient that the two window screens in the front upstairs bedroom (twin beds) had rather large holes making it too easy for the wasps lingering about to make their way inside when the windows were opened. Overall, It's a beautiful space reflecting a comforting and artistic taste -- meant to bring a sigh and a smile to all who enter. The front porch (soothing gliders) is a great spot to daydream and watch the many chipmunks bouncing about. We would absolutely recommend this house to friends. Thank you for taking the time to write such a lovely review of our home. We are glad you saw it as a relaxing and beautiful place. I was particularly pleased you noticed the well equipped kitchen, and the artful touches, as I try to make the home comfortable and tasteful and with some whimsy. And that you were happy with our responsiveness. I'd like you to know that as soon as you sent us an email telling us about the hole in the screen we had that fixed. (We do try for perfection, but there's always something that pops up with houses, as you know.) Many thanks! Best, A. We had a great stay at David and Andy's home. The views are great, it's only 5 min to the slopes, and the house is bright and so well equipped. Thanks. We'll be back. Cross country ski or snow shoe right out back door. Bird and creature watching. Amazing views from deck and most rooms in house. 10% off for 7 night stays. Standard rate applies to non-ski season and not on holidays. Please email if you want to request a different number of days. Fabulous, panoramic view! Well equipped kitchen. Large bright bedrooms. Sorry, no dogs, smoking, extra guests. The house sleeps 6. Thanks!